Next Article Killie v Rangers: With my big Kilmarnock bunnet? After what seemed an incredibly long January and winter break from Scottish football, the games are coming thick and fast again for Rangers as we enter February. And, despite the end of the season still being a few months away, this week will be a defining one for the club. Not only do we travel (again) to the hallowed, erm, artificial turf of Rugby Park on Saturday in the next round of the Scottish Cup, we're on league duty tonight in Aberdeen. Lose both games and pride may be the only thing we can salvage from the rest of our campaign. Win both and finally, just finally we might gather enough momentum to challenge for silverware. As the old cliche goes, it's one game at a time though and tonight's match will be a fascinating one given Rangers have failed to beat Aberdeen in three attempts already this season. Yes, events may have gone against us once or twice, but these games have actually been good examples of our season: i.e. dominate possession but don't create nor take enough chances and then concede cheap goals. Steven Gerrard will be keen to change that tonight. But what Rangers team will turn up? First of all, inconsistency has blighted our season. No-one can deny we've progressed to a degree and have a better team from last season but we've still dropped far too many points and there have been few games where we can say we played well throughout the 90mins. Ironically that was the case in the league opener at Pittodrie last August where, despite going down to ten men after just 12 minutes, we contained Aberdeen very well, took the lead and only just failed to hold on - eventually sharing the points to an injury time equaliser. If we're to win this evening, that same work ethic along with improved discipline will be required. With that in mind the starting XI will be interesting - not just in terms of personnel but the system. Recent weeks has seen the manager test variations of 4-4-2 to mediocre effect as he tries to find places in his team for our January signings. Fans remain unconvinced regarding this but it's also fair to say our preferred 4-2-3-1/4-3-3 hasn't always been successful either - specifically when teams sit deep against it; as Aberdeen have done fairly well in the two games they've win against us this season. As such, will the diamond be deployed again tonight? Personally, I can't see it - not to start with anyway. In games against Aberdeen, winning the midfield battle is imperative and matching their physical outlook a must so it would be a big risk not to match that early in the game. Yes, if the match stays tight and if Aberdeen want to sit deep, then moving to a more expansive outlook may be the best alternative strategy but when Bobby Madden blows his whistle to start tonight's contest, I'd expect the same system that served as well in our win over Celtic. Of course the players may well be different. Andy Halliday hasn't let us down this season but we have to hope Borna Barisic is now fully fit and ready to demonstrate why he should be our first choice left back. Meanwhile, at centre back it appears Connor Goldson is also fit again so it will be interesting to see if he comes straight back into the team tonight instead of Katic or Worrall. 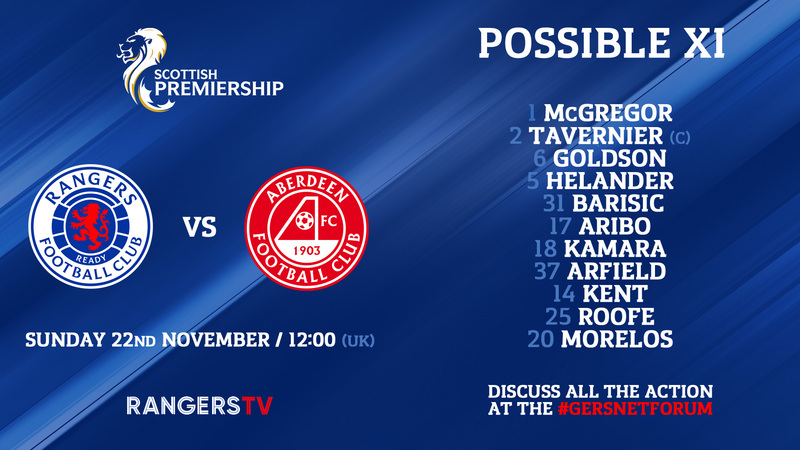 Other than those two changes, I'd expect the rest of the starting XI to match that of the Old Firm win and with lots of options from the bench, we really need to prove our mettle by beating Aberdeen convincingly for the first time in a while. And, if we're honest with ourselves, if we can't do that - and win on Saturday evening - then we're not worthy of winning trophies anyway.